We may live in the land of athleisure, but that doens't mean sporty can't be chic. With the stormy weather we've been experiencing, it's hard not to reach for what's the most cozy and comfortable against the wind and rain. The puffer - once a staple of skiers and athletes - has been elevated to new levels of chic by nearly every one of our favorite designers. Made with ethically harvested down, while featuring subtle, sophisticated colors and silhouettes, this piece is a now brainer when it comes to outerwear. Herno 3/4 quilted jacket, J Brand leather jean with ankle zip, Rag & Bone "Natasha" cashmere sweater, Grisal scarf, Rene Escobar 18k gold and sterling silver bangles with diamonds, Jack Gomme "Anna" shoulder bag. Pair your puffer with slim layers to avoid the marshmallow look. A cashmere turtleneck and stretchy leather jeans accented with luxe accessories will keep you warm and stylish, no matter the weather report. Call it what you will - bordeaux, plum, shiraz, garnet, wine - but deep, rich burgundy red is THE color of the fall season. Midnight blue may have given it a run for it's money, but bordeaux is the clear winner here and it's reign will definitely continue into the holidays. It's an easy color to incorporate into your closet and works well for both day and evening. We've put together a bordeaux heavy look that's super bold yet still easy to wear. When wearing more than one piece in this hue, keep your silhouettes clean and your accessories neutral so the color can shine. Fall fashion brings to mind cozy sweaters, luxe layers and preppy accents. We've taken the classic Ivy League look and turned it on it's head; it's totally cool and not at all conservative. Pair a classic fair isle sweater in a shrunken silhouette with a crisp white shirt and neck tie patterned silk skirt, all classically preppy pieces done in new and interesting ways. 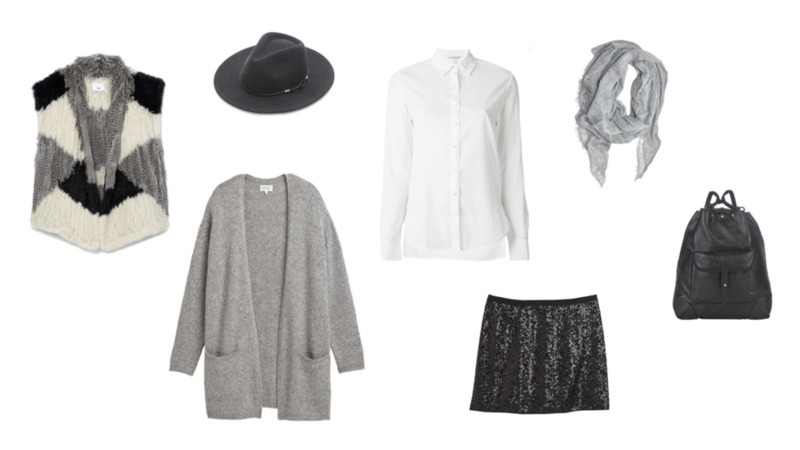 Top the look off with a wide brimmed hat, lightweight scarf and a leather and shearling backpack to add a little edge. Sport your prepster duds with a bare leg and suede booties while the weather is still mild, then add some wooly, charcoal tights or over the knee socks once the temps dip. Fashion used to have rules that were strict and finite. We've heard them all before: no white after Labor Day, don't mix black and navy, always match your purse to your shoes, and sequins and sparkle are soley for after 5 PM. Well, we're here to tell you that none of the old rules apply anymore. We love to add a little sparkle to any outfit, whether that means carrying a glittery clutch instead of a leather handbag or layering a sequined sweater over an otherwise casual, daytime look. From Left to Right: Vince Color Block Knit Fur Vest, Hartford Moha Cardigan, Rag & Bone Dakota Hat, James Perse Button Up Shirt, Hartford Jom Skirt, Grisal Melange Scarf and Rag & Bone Grayson Backpack. Sparkle can be both sophisticated, edgy and effortless. Luxe layers in daytime fabrications will instantly add a casual edge to your ensemble and flats are a must. We would add some classic penny loafers to this look and even some textured tights once the weather turns cool.